The Organic Research Centre in collaboration with FiBL, the Swiss Research Institute of Organic Agriculture, have recently published a comprehensive technical guide that aims to help farmers reduce the impact of problem docks on their land. The two main dock species, broad-leaved dock (Rumex obsusifolius) and curly dock (Rumex crispus L.) are a major problem for most farmers, particularly organic farmers, who without the use of herbicides find the problem particularly challenging. As well as a series of practical solutions, the technical guide highlights the strengths and weaknesses of this pernicious weed. Docks have a large storage root with regenerative buds at the crown. They also have enormous reproductive potential – and one plant can produce up to 60,000 seeds per year. With its early germination capacity combined with robustness, many farmers may clearly battle to eliminate this problem plant from their land. Depending on the level of dock infestation, the guide outlines different techniques for removing and suppressing established docks. Only by dealing with the causes of dock proliferation can the reproductive cycle be broken and long-term control achieved. However, the most promising approach is a combination of several measures. Significantly the guide explains how by understanding the dock’s biology it is possible to exploit the plant’s weaknesses. For example, broad-leaved dock spreads most rapidly in intensively cultivated grassland with excessive fertilisation or manuring and over-grazing as well as in under-grazed or poorly managed pasture. Wet fields and soils rich in nitrogen, potassium and magnesium are particularly inclined to encourage docks. Conversely on poor, shallow soils, docks grow rather poorly. And, dock seeds are dependent on light to germinate, so a dense sward will help prevent them getting established in grassland. The technical guide gives clear guidance on the strategy’s needed to reduce the impact of docks in both permanent pasture as well as arable land. It also outlines techniques for restoring highly infested land and presents the latest technical innovations that have been developed on dock control. 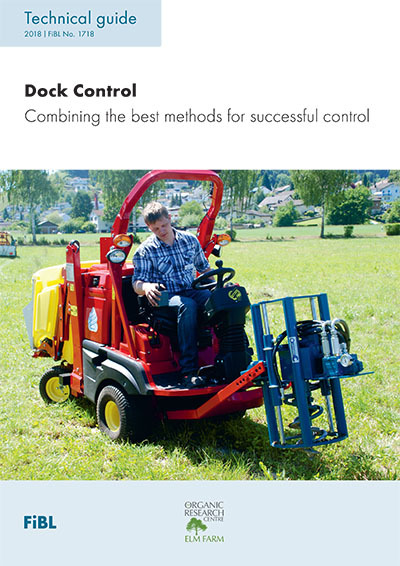 The Technical Guide – Dock Control: Combining the best methods of successful control, can be downloaded here or alternatively, hard copies are available from ORC at a cost of £6.00 including postage. The technical guide was produced as part of the Organic Knowledge Network Arable project funded by the Horizon 2020 programme of the European Union. The Organic Research Centre (ORC): established in 1980, is the UK’s leading independent research charity for the development of organic/agroecological food production and land management solutions to key global issues including climate change, soil and biodiversity conservation, and food security. Research Institute of Organic Agriculture (FiBL). FiBL is an independent, non-profit, research institute with the aim of advancing cutting-edge science in the field of organic agriculture. FiBL’s research team works together with farmers to develop innovative and cost-effective solutions to boost agricultural productivity while never losing sight of environmental, health and socio-economic impacts. Alongside practical research, FiBL gives high priority to transferring knowledge into agricultural practice through advisory work, training and conferences. FiBL has offices in Switzerland, Germany, Austria, France and Brussels (FiBL Europe) and numerous projects and initiatives in Europe, Asia, Latin America and Africa. The Organic Knowledge Network Arable (OK-NET Arable) ran from 1 March 2015 to 28 February 2018. The project is financed by Horizon 2020, the EU’s main funding instrument for research and innovation. It was coordinated by IFOAM EU and involved 17 partners from 12 countries all over Europe. The project established the OK-Net knowledge platform for farmers and farm associations to find practical solutions in organic farming and at the same time discuss how it works in the field, in their geographic and climatic conditions.